If you want classic analog handling but can't skimp on superior digital effects and studio-grade mic preamps, the SX2442FX is your new best friend. 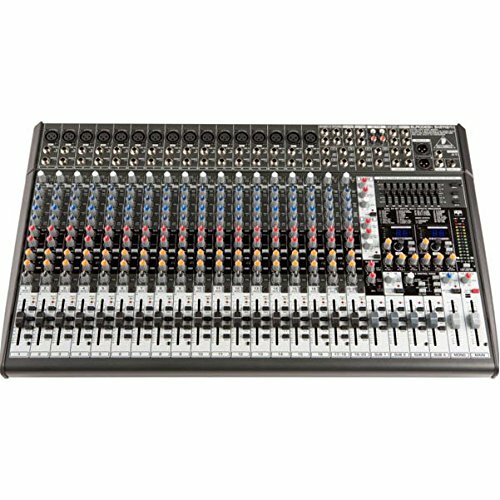 This mixer's 16 mic inputs, 8 stereo inputs and 4 buses give you enough leeway to handle anything from a graduation speech to a small orchestra. Each of the SX2442FX's 16 mic inputs connects to our world-famous, studio-grade XENYX mic preamps. They are legendary for their high headroom, warm natural timbre and utter lack of background noise. Plug in a large-diaphragm condenser mic and track a vocal to hear XENYX's rich detail and spaciousness. Plug in a dynamic mic and stick it inside a bass drum to appreciate the whopping headroom. Some manufacturers make what they call 24-input mixers that count stuff like CD/TAPE IN as an input. But the SX2442FX really gives you sixteen honest mono channels plus eight stereo channels, making it easy to accommodate a variety of studio or live performance configurations. You can connect up to 16 microphones or other mono instruments and up to four stereo instruments (keyboards or tone modules, for example). You can combine these input in four different sub-mixes (we call them buses). That allows you to blend multiple channels - say all the mics on a drum kit or all the backup singers' mics - to a single fader, which is easier to adjust for the overall mix that goes to the PA speakers. You can also use one or more of the sub-mix buses to create custom monitor mixes for picky members of your band ("More me! More me!"). Whether you need to add a dab of reverb or delay to a live vocalist's mic or warp a hard day's studio session into psychedelic quicksand, the SX2442FX has you covered. We gave this mixer two independent studiograde 24-bit stereo FX processors with 99 awesome presets to provide the perfect sonic garnish. "Sure they're great for live sound, but I have a lot of cool plug-ins for recording," we can hear some of you saying. Truth be told, you never have too many effects. And when you hear the quality of the SX2442FX's FX, you may want to give your overworked CPU a rest. Naturally we gave you a whole palette of creative effects like reverb, chorus, flanger, delay and pitch shifter tones, as well as mind-bending multi-effects to take your sound out of this world. But you also get problem solving workhorses like compression and gating plus final effects such as Ultramizer, Ultrabass and Exciter that can put a PA or studio mix over the top. And because there are two processors, you can cue two separate effects, then apply one or both to channels 1 through 20 - compression for the vocalist, reverb for the vocalist and snare drum, for example. What the Heck is "British EQ"? Think of it as kinder, gentler, more musical EQ like the type found on classic British consoles from the 60's and 70's. Single malt scotch instead of Everclear. Home-baked cherry cobbler instead of an artificial cherry lollypop. British EQ's distinct configuration of wider curves/lower Q and harmonic phase characteristics allows you to add or subtract EQ more generously than you can with conventional EQ circuit designs. When you add low midrange, you get a firmer sound instead of a nasty bonk. When you back high frequencies off a bit, treble backs off just a hair instead of turning muffled. All SX2442FX mono channels have low and high shelving plus a sweepable "midrange" you can move anywhere from 100Hz to 8kHz. Think of it as your roving English troubleshooter. At the top of each mono channel, you'll find both a balanced XLR input with a XENYX mic preamp and a 1/4" input. A phantom power switch located on the back near the main power switch accommodates condenser mics. Trim control and level set LED let you adjust the channel's input level for maximum headroom and minimum noise - the huge range of this control can handle anything from a very timid vocalist to a close-miked guitar amp stack. Near every mono channel's fader you'll find a 1-2, 3-4 and MAIN button. By engaging the MAIN button, the signal is sent to the main mix. Or, if you engage the 1-2 button, the channel becomes part of a bus. Twist the PAN control all the way to the left to assign it to Sub 1, or all the way to the right for Sub 2. The same principle applies to the 3-4 button. A Mute button with accompanying LED cuts the signal from the channel, and a Clip LED helps you dial in a distortion-free post-EQ signal. The Solo button on individual channels routes the subgroup signal to the solo bus or Pre-Fader Listen - depending on whether the signal has been included in a subgroup. Instead of XLR inputs, stereo channels 17-24 have left and right balanced/unbalanced line level inputs. Channels 17-20 feature the same controls as the mono channels, but with a four-band EQ that gives you control of HIGH, HIGH MID, LOW MID and LOW. This is especially useful for EQ'ing the critical midrange frequency content found in keyboard signals. Stereo channels 21 through 24, designed for signals that do not require EQ, have a simplified interface consisting of a Level, AUX1 and AUX2 dial. Can you say laptop backing track feeds, drum machines, tone modules, DJ mixers or CD players? We solved the problem of what to do when you want to play music during breaks but don't want to have to mute every channel or turn down every fader. Just push CD/Tape STANDBY button to A) mute all mixer channels and B) solo just your CD/Tape source. We didn't just give you a MONO output for subwoofers. We gave it a built-in variable low pass crossover, saving you money on outboard gear. We added a footswitch jack that you can use to control either internal or external effects. We gave you a complete Phones and Control Room assignment matrix so you can send mains, buses, CD/Tape or auxes out at the touch of a button. We added a routing button to Talkback so you can talk directly to either a monitor mix or the house mix for public announcements. We made the 9-band equalizer assignable to either AUX 1 or the main mix. Not every town on the planet uses the same voltage common in yours. Unfortunately, this sometimes doesn't occur to jet-setting sound technicians until they're 5,000 miles from home. With the SX2442FX, this is never an issue. The internal autorange power supply can run on anything from 100 to 240 V with noise-free audio, top-quality transient response and low power consumption.